A while ago, I posted about Getting IntelliSense working in ASP.NET MVC 3. Since the release MVC 3, the primary view engine has changed to Razor, and the previous technique isn’t as elegant. 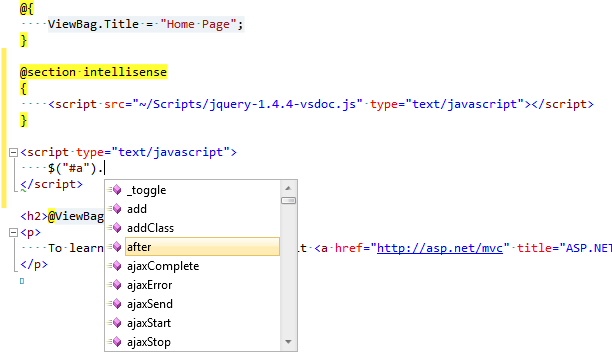 With that in mind, I searched for a slightly prettier way to get IntelliSense working in Razor views. I was, unfortunately, unable to get the scripts to be referenced in the views automatically, but I think that this way is clean enough. The following sections have been defined but have not been rendered for the layout page "~/Views/Shared/_Layout.cshtml": "intellisense". And we know that we don’t want to render it to the final output, so we have to come up with a way to trick the Razor engine into thinking that we did, in fact, render the output. That is just enough to get it to work properly and display the IntelliSense as desired. I am still looking for a way to get this to happen automatically, but for now, placing the @section intellisense region at the top of each view will have to do.